Ideas, Inventions And Innovations : Can Chocolate, Tea, Coffee and Zinc Help Make You Healthier? Can Chocolate, Tea, Coffee and Zinc Help Make You Healthier? Ageing and a low life expectancy are caused, at least partly, by oxidative stress. A team of researchers led by Prof. Dr. Ivana Ivanović-Burmazović from the Chair of Bioinorganic Chemistry at FAU, together with researchers from the USA, have discovered that zinc can activate an organic molecule, helping to protect against oxidative stress. The results have now been published in Nature Chemistry*. Zinc is a trace mineral we need in order to remain healthy. FAU researchers working together with Prof. Dr. Christian Goldsmith from Auburn University, Alabama, USA, have discovered that zinc can protect against the superoxide responsible for oxidative stress when taken together with a component found in foodstuffs such as wine, coffee, tea and chocolate. This component is a hydroquinone group found in polyphenols, in other words the plant substances responsible for smell and taste. Zinc activates the hydroquinone groups, producing natural protection against superoxide, a by-product of human cell respiration which damages the body’s own biomolecules, for example proteins or lipids, as well as the human genome. Superoxide is thought to have a role to play in the ageing process and a number of illnesses such as inflammation, cancer or neurodegenerative diseases. For the first time, the function of this enzyme has been copied without reverting to redox-active transition metals such as manganese, iron, copper or nickel. Whilst the metals could also have an antioxidative effect, any positive effects are quickly outweighed by the fact that if too much is taken they can even cause oxidative stress to increase. Zinc is much less toxic than the transition metals mentioned above, making it possible for new medication or supplements to be created with considerably fewer side-effects. It would also be plausible to add zinc to food which contains hydroquinone naturally to boost the consumer’s health. 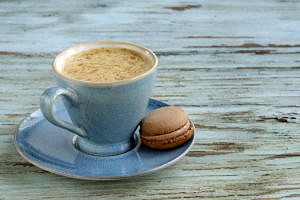 ‘It is certainly possible that wine, coffee, tea or chocolate may well become be available in future with added zinc. However, any alcohol content whatsoever would destroy the positive effects of this combination,’ emphasises Ivana Ivanović-Burmazović.